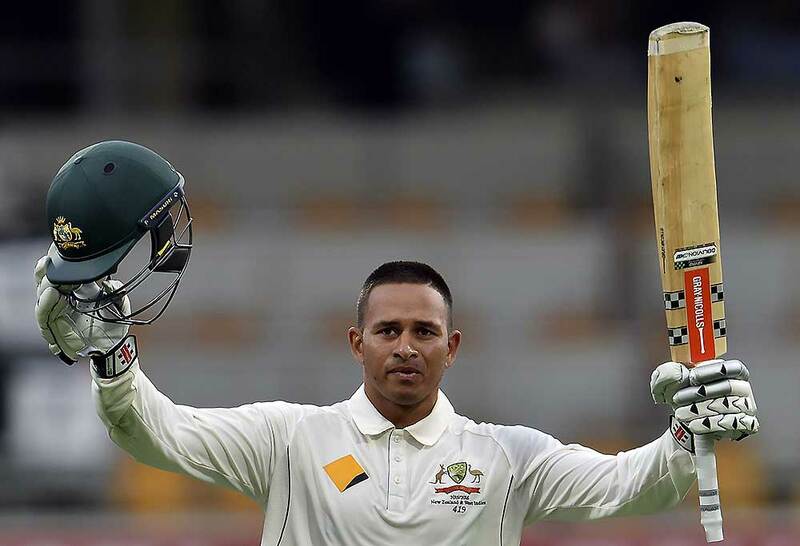 Usman Khawaja has cemented his spot for next month’s Tests in the UAE after scoring a crucial hundred yesterday on Day 1 of Australia A’s opening first-class game against India A in Bangalore. Khawaja looks likely to open the batting with Matthew Renshaw in the Tests against Pakistan based on his successful move to the top of the order yesterday. The left-hander scored 127 out of a paltry total of 243 as Australia A had an awful start to the two-match series. It wasn’t spin which undid the Australians but instead the sharp pace and swing of Mohammed Siraj, who scythed through them with 8-59. Khawaja reportedly looked at ease against Siraj, with Marnus Labuschagne (60) and Kurtis Patterson (31) the only other Australian batsmen who made double figures. The 31-year-old Australian has laboured badly against spin while playing Tests in Asia, where he’s averaged just 14 from nine innings. These struggles saw him dumped for last year’s tour of India, only to be recalled for the following series in Bangladesh and then dropped once more when he made scores of 1 and 1 in the opening match. But Khawaja is a wonderful player of pace bowling, so opening the batting in the UAE would give him the chance to get well set against the quicks before encountering Pakistan’s tweakers. The omission of incumbent Test opener Joe Burns from the current Australia A tour has been widely interpreted as a sign he will not be selected in the UAE. Khawaja’s main competitor to open alongside Renshaw against Pakistan is fellow veteran Shaun Marsh. But his ton yesterday will give the selectors a strong reason to open with him and bat Marsh at three. Also in Khawaja’s favour is the fact he is a better player of fast bowling than Marsh, which will be an important consideration given the great strength of Pakistan’s pace unit. Khawaja has opened just twice in Tests but has been remarkably successful in that tough position. In his first Test innings at the top of the order, he struck 145 on a lively Adelaide pitch against the pink ball opposed to a gun South African attack of Kagiso Rabada, Vernon Philander and Kyle Abbott. The only other time Khawaja opened in Tests he made 79 not out against Pakistan at Sydney while filling in for Renshaw. As I wrote recently, Pakistan’s talented pace attack will test Australia next month, so it makes sense for them to open with their two best players of fast bowling in Renshaw and Khawaja. Renshaw missed this opening Australia A match due to a hamstring strain but is likely to be fit in time for the first Test against Pakistan starting in five weeks’ time. The 22-year-old showed some great signs in the Tests in India last year, playing spin with confidence as he started the series with scores of 68, 31 and 60. He faded after that as he battled against pace, particularly right-armers bowling from around the wicket. But Renshaw went back to Sheffield Shield cricket, worked on that issue and has since been in dominant form in first-class cricket, with six tons in his past 14 matches amid a haul of 1235 runs at 56. If fit, I think the selectors will consider Renshaw a lock for the first Test against Pakistan along with Khawaja, Tim Paine, Nathan Lyon, Mitchell Starc, Shaun Marsh, Glenn Maxwell and Mitch Marsh. The last batting spot in the Test team looks set to be contested between incumbent Peter Handscomb, who also impressed at times in India last year, and youngsters Patterson, Labuschagne and Travis Head. Patterson, who opened with Khawaja yesterday, has been very consistent in first-class cricket, averaging 46 with the bat over the past three years. Labuschagne is much more of a bolter. He was not in the original Australia A squad for these first-class matches and was drafted in as cover when Renshaw got injured. But the 24-year-old will surely have impressed the selectors yesterday by scoring 60 after coming to the crease amid a batting collapse, with Australia A having just lost 4 for 12. He and Khawaja put on a partnership of 104 before the departure of Labuschagne sparked another collapse. Head (4), Handscomb (0), Mitch Marsh (0) and Alex Carey (4) all failed yesterday. While I would still regard Handscomb as the favourite to secure a middle-order berth against Pakistan, any of Head, Patterson or Labuschagne could vault into the side if they shine in this series.